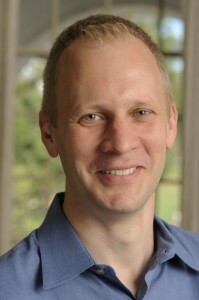 Johnston, an assistant professor in the university’s Krieger School of Arts and Sciences, was selected to the 2014 Pew Scholars Program in the Biomedical Sciences. He is one of 22 biomedical scientists to receive this year’s award. 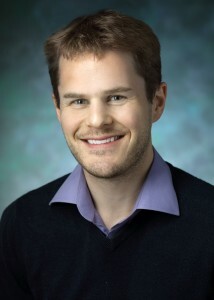 Holland, an assistant professor of molecular biology with a secondary appointment in oncology in the Johns Hopkins School of Medicine’s cancer biology program, was named a member of the inaugural class of Pew-Stewart Scholars for Cancer Research. He is one of five Pew-Stewart Scholar recipients. The two awards from the Pew Charitable Trusts come with a grant of $60,000 per year for four years or $240,000. Johnston’s lab uses the fruit fly eye as a model to show how cells make random choices, much like flipping a coin, to decide what type of cell they will become and what types of functions they will carry out. These random choices are important for the development of neurons, immune cells and stem cells. Johnston’s findings will have implications for our understanding of vision disorders, autism, immunodeficiencies and lymphoma. Johnston said the Pew award will allow his lab to use new technology such as next-generation sequencing and high-resolution microscopy to determine the molecular mechanisms controlling random cell fate choices. Beverly Wendland, professor and chair of the Department of Biology at Johns Hopkins, said Johnston’s research adds a new dimension to the department and complements the exciting research already taking place among the faculty. His award checks off another benchmark that is vital for the success of an early career scientist, she said. Holland’s research focuses on the molecular mechanisms that control the number of centrosomes in a dividing cell; centrosomes are the structures that segregate chromosomes to daughter cells during cell division. An abnormal number of centrosomes leads to an abnormal distribution of chromosomes during division, a trait of many cancer cells. But it’s unclear whether an abnormal chromosome number, known as aneuploidy, is a cause or effect of cancer. Holland is designing a mouse model that will allow scientists to control the number of centrosomes in cells, so that he can further study what happens when chromosome distribution goes awry. His work could lead to the development of novel therapies for the treatment of cancers. Carol Greider, director of the Department of Molecular Biology and Genetics at the School of Medicine, and a Pew fellow herself, praised Holland’s selection to the new class of scholars. Rebecca W. Rimel, president and CEO of Pew, praised this year’s class of scholars for their contributions to scientific discovery. The Pew Scholars Program in the Biomedical Sciences supports promising researchers in the health sciences, particularly young researchers with innovative approaches and ideas. The Pew-Stewart Scholars for Cancer Research is a joint effort between Pew Charitable Trusts and the Alexander and Margaret Stewart Trust. The partnership is part of a national initiative to support promising early career scientists whose research may accelerate discover and advance progress to a cure for cancer.